So today I am going to solve a world of problems for you. Today I’m making your cookie baking life simpler. I mean, who doesn’t want some simplicity? AmIrightoramIright? So today we’re going to talk about the perfect cookie base. A cookie recipe that you can adapt until your heart’s content…quite possibly the only cookie recipe you’ll ever need. Ok, that’s probably too dramatic a phrase…but you get me, right? It will turn out perfect every time, I promise. Above you, you’ll see cookies. They are all made from the same recipe, but they are all different. This cookie recipe will hold up to even your most caramelly candy. Honest. You see, I added cornstarch. It seems to be the new trend in cookie baking. Some people claim that baking with cornstarch in your cookie will make them puffy and soft. I didn’t notice that so much, but what I did notice was it gave them the perfect texture for add-ins, with a perfectly soft and not under-baked center. 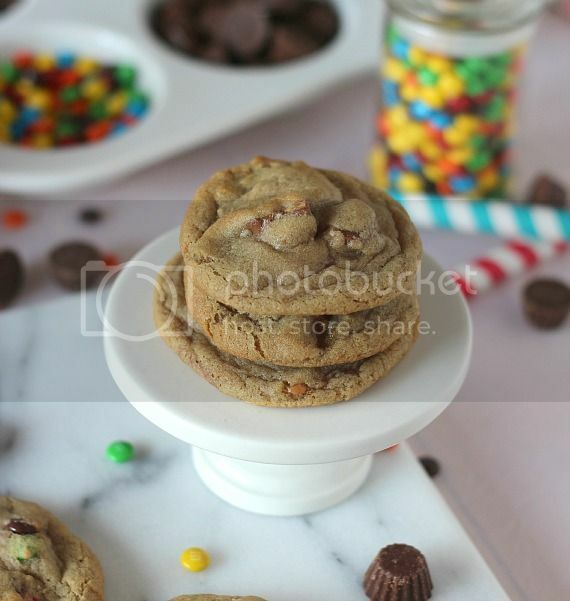 I played around with the recipe a touch and came up with the perfect cookie base for any candy addition. Start with some butter and sugar. Duh. Of course add in an egg and some vanilla. *If you’re adapting this to say an Almond Joy Cookie, You can sub in a coconut extract for the vanilla. Just an idea! Feel free to place around with other flavors, like almond or mint! Next up whisk your flour, baking soda, cornstarch and salt together. Honestly, I’m not usually a whisker of dry ingredients…I’m lazy. 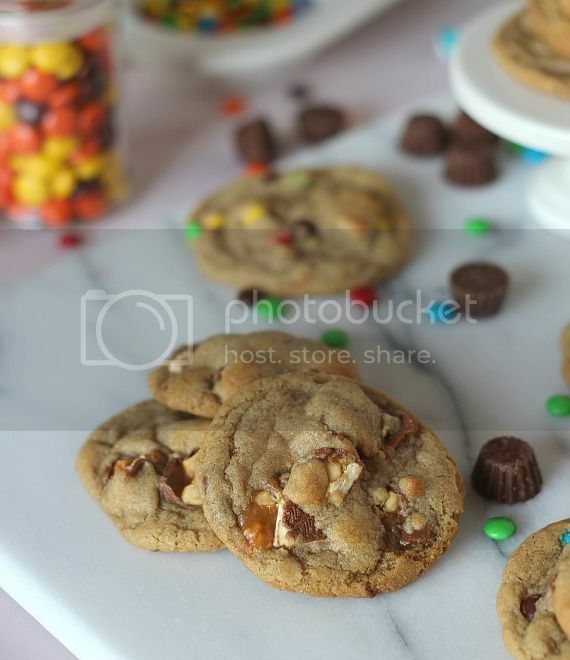 Then bake them just like any normal cookie…although if you are baking with a super caramelly candy, like Snickers, Milky Way or Rolo…you might want to freeze your candy before you add it in. And always use parchment paper…it’ll save you a load of trouble. So yeah. This is the best base cookie that I have come across…I mean, it doesn’t take the place of my Favorite Chocolate Chip Cookie Recipe, but it is great everyday cookie, and it doesn’t require chill-time, which means your cookie to mouth time is substantially lower. Try them, you’ll be happy you did! The perfect cookie base recipe that you can use time and time again! 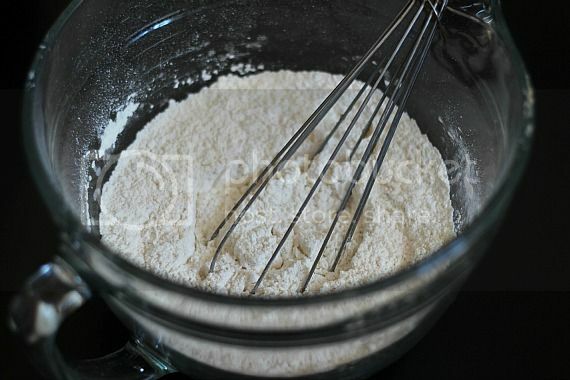 In medium bowl whisk together flour, cornstarch, baking soda and salt. Set aside. 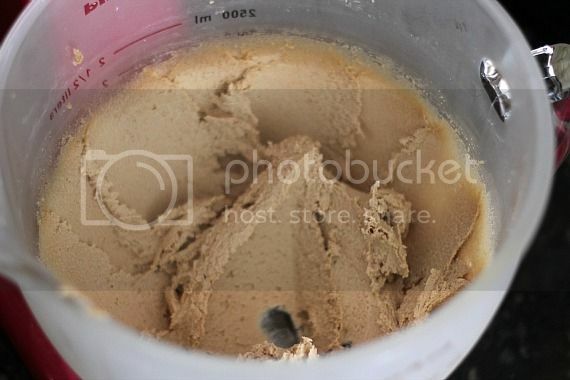 In mixer cream butter and both sugars together on medium speed, beating until light and fluffy 2-3 minutes. Turn mixer to low and add in egg and vanilla. Turn mixer back up to medium and mix until incorporated, scraping sides when necessary. Turn mixer to low and add in flour mixture until dough comes together. Stir in candy until evenly distributed. Drop by heaping tablespoon onto lined baking sheet and bake for 8-9 minutes until edges are just golden. Make sure not to over bake. Remove from oven, let cool on baking sheet for 3 minutes, and then transfer to wire rack to finish cooling. When adapting this recipe…feel free to swap out vanilla extract for another flavor for an extra twist! It is SO handy to have a go-to recipe like this! I have one for brownies and love adding different mix-ins each time. Yours truly looks like the perfect cookie base to me! Looks so yummy! I am curious if you could also use this base and change up the flavour? Would you be able to add almond extract, or mint, or cocoa? Do you often make flavoured cookies? Absolutely! I tried it with coconut extract and chopped up almond joy and it was fabulous! 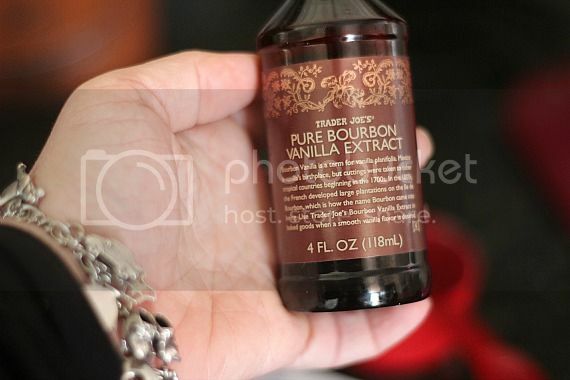 Do you add extracts instead of vanilla, or in addition to vanilla? I would use the extract in place of vanilla! What a great resource! All those mix-ins look great! In love with this. Cornstarch is super in a cookie base, but to find a great base that will hold up to Snickers bars is serious business. Thank you!!!! Thank you so-ooooo much for this FANTASTIC recipe! This really does solve ALL my cookie worries/problems! YOUR A DOLL!!! ? I am now on a delightful sugar high after reading this gorgeous post! YUM-O! That base looks so fabulous!! Yum! Thank you for sharing! A good cookie base is essential and I know you know your cookies!!! This is great! I have tried chocolate chip cookies with cornstarch and loved how soft they were! I will have to try this one! Looks delish! Mmm, pretzels. I can’t wait to experiment. I love a low cookie to mouth time. Can’t wait to play with this recipe! Great Recipes! Thanks a lot! I know you mentioned these do not need chill time but I am wondering, if I did chill, would it cause a problem? I like to chill to let the flavors meld together. Oh, I can’t imagine it would be a problem at all…I bet that will make them extra good! I love your little “pin it” button on all the pictures. And the cookies look great! Looks perfect to me! 🙂 I wish we could be neighbors too…I could eat your cookies and you can have my risotto! You’re Awesome coming up with the perfect cookie base and sharing it with all of us. Your cookies look absolutely fantastic. I just got finished making some Chocolate Chip cookies but will be using your base recipe from now on. Those candy shots remind me of these old pizza hut commercials where the little kid is looking longingly at all the sundae toppings. Yum! Love the first picture! That’s gonna go viral on Pinterest for sure! I’ve been loving this dough base, too! I started using it about 6 mos ago (thank you Pinterest!) Cornstarch is such a workhorse and although I do chill the dough before I make cookies with it, it’s good to know you don’t and don’t have any spreading issues. 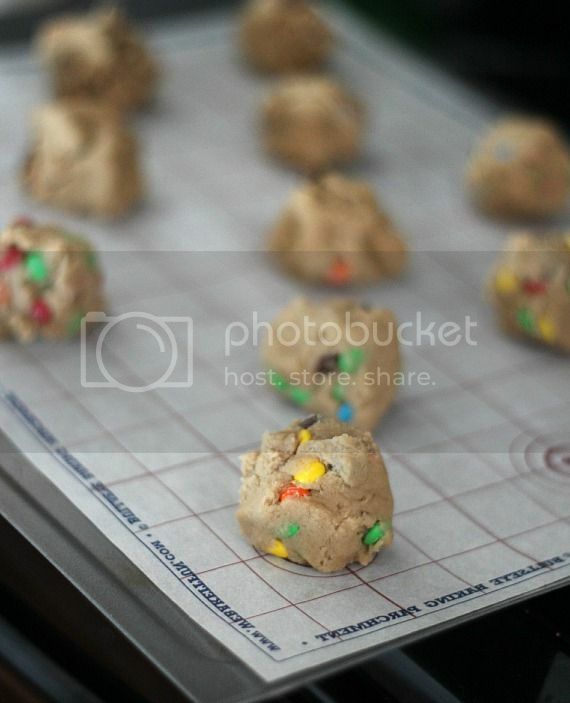 I just used this base for some M&M cookies this week and they’re the best M&M cookies Ive ever made because the dough base is the perfect sweetness/chewy/buttery-ness! I started adding bread flour to my cookies to give them a super chewy texture…and now here you are telling me the REAL secret is cornstarch! I need to try. Oooh, I cant waitto try out this cookie base! Love the variation choices!!! A good go-to cookie recipe is essential, and a huge time saver! Love all the mix-ins to change up the traditional cookie! I love you for posting this! Thank you!! love this post. it is very smart to use one basic recipe and then add variations to it … so much better than remembering so many different proportions and various ingredients of recipes! Cornstarch cookies are the best! You cookies are so drool worthy! Made these today with choco chips, white choco chips, walnuts and coconut… came out awesome but mine took about 11 mins to bake and made about 32. They came out perfectly fluffy and moist!! Thanks!! I do have a tendency to make large cookies 🙂 Thanks for the feedback!! Cant wait to try it , thank you! That looks like one awesome recipe! I don’t think I’e eer added cornstarch to cookies–trying it…. I love a good cookie base and mixing up with whatever my mood desires! Thank you for sharing! these are screaming for me to make them! and I agree parchment saves a lot of clean up. Could you use this for a cookie cake? Yep! I bet it would work perfect! Super informative post. I wanted to let you know that I featured this today in my “What I Bookmarked This Week post.” Stop by and see! Dear LORD these were the best cookies I think I ever made. 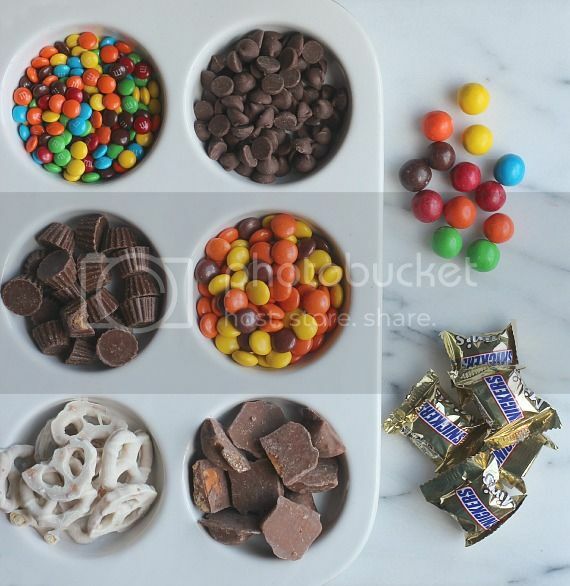 I cut up Reeses peanut butter cups, mini snickers, mini Three Musketeers and mini Milky Ways and tossed in and they are SO DELICIOUS. Crisp to the touch but chewy when you eat them. PERFECT thank you so much!!! Yummmmmmm! It certainly looks like an amazing cookie recipe, the perfect base for add-ins. I love recipes like this where you can do anything to it! Just made these and I can confirm that they’re excellent! Yes! An “every mans ” cookie. 🙂 Can’t wait to try it. Must I use dark brown sugar. Would light brown sugar do? This is a great cookie base! I made these yesterday with Heathbar English Toffee bits and chocolate chips and they are fantastic. I’ve received rave reviews from everyone on this cookies. Thanks for the recipe! Hi, I was wondering if I can add real fruits or preserves? In your recipe when you mention the cups are you using standard metric or US cups. I know there is some variation between the two. I am so looking forward to trying these as I found them on Pinterest. US cups… 8 oz, approx. Can i use this recipe and use a muffin top pan? If so, will the baking time change? Sure, but yes, you’ll have to cook them a few minutes longer. Awesome! Perfect for Christmas cookies! One question, where did you get that baking parchment? I need that in my life! Thanks! Awesome! Perfect for Christmas cookies! One question, where did you get that baking parchment? I need that in my life! I made the cookie recipie today and they came out flat. 🙁 any idea to way and how I can fix it? I don’t believe that plays a part. I made these cookies tonight and they came out puff(cake like) I thought they would be flatter and crisp to the touch but chewy. Wonder why this is..?? Any suggestions on how to fix that? I baked half of the batch and I am chilling the other half to see if that helps..
THat’s so strange! I haven’t ever had that at all…my best guess would be you overbaked them a little bit. Take them out when they begin to golden around the edges..if they still seem a bit underdone in the center it will be fine.. let them cool a bit on the baking sheet and then transfer them over to a wire rack to finish cooling. It seemed like they didn’t spread out as much. Even after I chilled the dough for an hour. Hmmm I just wish I knew what I did wrong. Mine didn’t look as delicious as yours. They didn’t have the nice folds on top and they were more puffy rather than thin crisp and chewy. You are AWESOME!! I’m using up all my leftover Halloween candy to make batches for my “adopted” soldier. This recipe is seriously on point and delicious!! If i bake them on a muffin top pan how many minutes do i have to bake them? I don’t have any brown sugar! Can I sub honey or molasses? I woke up yesterday morning and had this sudden urge to bake cookies for some reason! (The last time I made them was using Betty Crocker’s expired cookie mix and safe to say I thought I won’t try my hand at cookies again). Anyway I googled, came across your recipe and aha! they turned out to be so good Masha’Allah. Yummy and crunchy and chewy. I think i overdid the salt and baking soda but guess that counts as learning for next time. (wait- next time?! yes!) Thanks alot for sharing this recipe and specially for the pictorial depiction. Hi! I read this recipe and it is AMAZING! !I have a question though, can you add gummies? Like Welches or some sort? Thxs again for the awesome recipe!! I just tried these and although I haven’t sampled any yet (I am sure they are delicious) my cookies didn’t spread out nice and thin like yours… they remained somewhat in their ball formation. I love thinner cookies so was wondering what I may have done incorrectly for this to happen? That’s strange! Could be a difference in the oven temperature..
Do I have to add something liquid to add cocoa powder to this recipe? No, you should be fine! Love this cookie base recipe! Mine is so similar, but I use all brown sugar instead of white and always add a dash of cinnamon to help emphasize the flavors of the add ins. It’s so easy to whip up a bathc of the base and then portion out to make several different kinds using add ins. Love it! 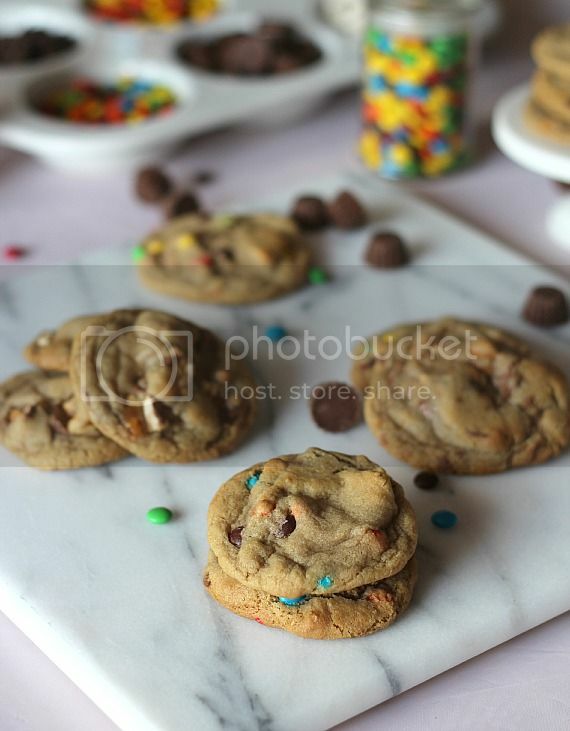 I used your base recipe and added those cherry filled chocolate chips….Sooo good. This is my new FAVORITE cookie recipe!! Oooh what a great idea!! I need to go pick some of those up! Wow. This is perfect beyond words. I didn’t know I was looking for this until I stumbled upon it. Godsent, I’m sure. Do you think it works with PB & J? Because I’ve been looking for PB & J cookie recipes and there are mostly thumbprints and sandwich but I want the peanut butter and jam to be swirled in the batter, you know? Do you use salted butter or unsalted butter? I’m going to try this with Andes Creme De Menthe baking chips….we’ll see how it goes. I always use salted, but if you are worried about salt content unsalted will work too! This is our new cookie recipe. We live at a higher altitude and this needed no measurement adjustments. The only thing that I did differently was flatten the cookies a little before and after baking. Thanks. Do you have the nutrition information on this cookie base? Specifically the carb count? This cookie base is amazing! I hate having to weed through comments from people who haven’t even made the recipe, who wants to read through 80 comments like, “This sounds delicious!”? I want actual comments from people who have actually made the recipe. I have, and this didn’t disappoint. Thank you! This was great! I made M&M cookies then made another batch of the batter and threw in chocolate chips, sliced almonds and coconut flake. Came out great! My go to cookie base from now on, saved so much time! Thank you!!!! Hi, tried your cookie receipes about two weeks ago,turned out great, I did not scroll down all the way down to the receipe just looked at the pictures and assumed,by the pictures 1 cup brown sugar,1 cup flour, 3/4the cup cornstarch, 1 egg,one stick of butter,salt,baking soda,came great,finally scrolled saw the receipe,used it ,did not come like the first batch.They didn’t spread out, your cookies look so great,help! Mine are in the oven right now, I used heath toffee and resse chips. Super stoked on the turn out! This Recipe was great, however, I was worried about the salt being too much for the recipe, and indeed it turned out tasting too salty for my liking. Next time I’m using 1/2 tsp salt instead instead of 3/4 tsp. ~I used white whole wheat flour, and used coconut sugar instead of the white and brown sugar. For the extra 1 1/2 cup “candies” I added were 1/2 sliced almonds, 1/2 unsweetened coconut, and 1/2 cup semisweet chocolate chips. This is my favorite recipe, and I’ll use it again… however with a little less salt. Thank you! Thank you for sharing. This recipe was easy to make and my cookies came out perfectly. I followed the directions as written. This will be my new go to basic cookie dough recipe. Just made this recipe tonight and I have a few thoughts. 1- I doubled the recipe and made 3 different mixture add-ins. The dough worked beautifully for each element. But the salt was really overpowering. I will make this again tomorrow with 1/3 of the salt. I’m also curious about the vanilla. If this resolves my issue, I will leave it as is, but the next step will be to tweak the vanilla amount. Overall- fantastic. Hi do you think these could have gluten free flour substituted for the other flour? I have used the brand cup4cup and have had great results with baking! I’m no baker, but I just tried this and it’s perfect! I usually don’t do well with cookies. I just made these with all kinds of weird substitutes (because I was using only what I had on hand), and they still turned out delicious! They aren’t too pretty (it turned out more like a cookie ‘cake’, but I’m confident that was due to my adjustments and laziness. ?